From a young child growing up with hundreds of acres surrounding his family’s rural home in Warren County Missouri, Billyo found himself becoming part of the land. He ran through the fields, explored the countryside, created toys from nature’s “clay” (only his had a few more details than his brothers) and learned to love the land and make it part of his being. 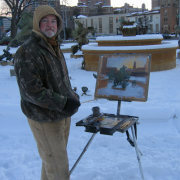 After college, some corporate art work, and traveling viewing museums/galleries and masters’ art around the country, he concentrated on painting outdoors becoming one of the top plein air artists in the country. 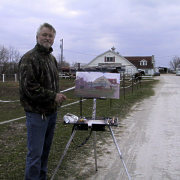 “Painting Missouri” is the journey of Billyo O’Donnell painting on location for seven years original oil paintings of the 114 counties of Missouri and the city of St. Louis. During this time, he faced almost every weather element imaginable from sub-zero temperatures in Holt County to humid and 100-degree heat in other counties. 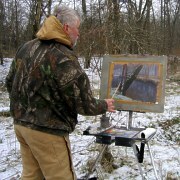 The life of a plein air painter is challenging as nature plays games with the artist with its wind, flying particles, rain, and snow. None of these prevented Billyo from forging ahead with his mission to paint Missouri. This vast collection of Midwestern impressions reflects an artist’s expedition across his home state that reveals a story with every painting. He describes the project as “a 200-year anniversary ‘re-look’ of Missouri since Lewis and Clark” and feels it connects both to Missourians and non-Missourians and relates to them in many ways. Viewing his efforts as a true American project in the heartland of the country, Billyo feels that the experience has caused him to achieve a stronger and richer connection to his time and place.